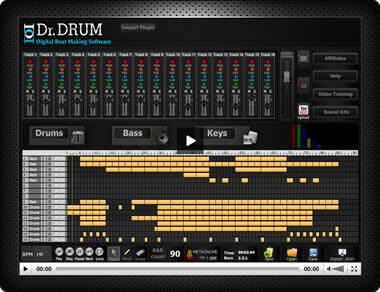 If you record your songs at home but can't use a live drummer, the alternative is to use digital drum software to create your beat. I review the best of those currently available online in this article. First of all, it really helps things along if you know something about how a real drummer creates a working beat for the kind of song you intend recording. This is because you really want the most realistic drum track you can get if you want your song to sound credible and appeal to a wide audience. A large percentage of songs that have been released over the past few decades using a drum machine or "digital drummer" sound wooden, false or just downright tacky. The reason for this is that the drum track was not created by a drummer or a person who understands how a real drummer works. Far too many machine generated drum tracks are produced by programmers who know nothing of real drumming and so their efforts sound like they've been created by a machine and not a human! That's fine for DJs playing their monotonous, thunderous beat heavy dance tracks at clubs because no one listens to the songs anyway. They just dance to the thud, thud, thud of the relentless, metronomic beat. If you are serious about creating a great song that you want people to actually listen to and maybe even sing along with, then you are going to have to create a drum track that sounds at least close to how a human drummer would play it on a live kit. There are a great many high quality drumming software packages available these days with great samples that can make the finished article sound like a real kit played by a real drummer to a click. The trick and the skill for the programmer is in making it sound real. Making the decision to go with a computer generated drum track rather than a real drummer for your precious song(s) can be a tough one especially if you're already used to working with a real drummist in a live playing situation such as in a band. But I understand it if you simply can't have your guy or gal set up their kit in your front room and start bashing away at a rate of high decibels when the neighbours are likely to get very cheesed off with you! I won't lie to you: I've used a drum machine for recording in the past too. It's just a case of doing what you have to do when needs must! So you are confident you can program a realistic beat track for your song and you now want some top rated software to generate it. There are several really good ones available at prices that are surprisingly affordable. If you're fairly inexperienced in this area, this really great product from Dr Drum could be just what you're looking for. For a start, it won't put a dent in your finances, since it costs less than most people would pay for a decent breakfast! But don't be fooled by the low price (currently under $30). This is powerful software that can create some amazing results when you figure out how to use it. Don't be scared off by the apparent learning curve either, because this one is really easy to learn and has tutorials that are easy to follow and take you step by step through the process of creating a first class drum beat for your song. You can produce great rhythm tracks using your computer, laptop or tablet whether its Windows or Apple driven because this product works on both! Are you tempted to take a closer look? 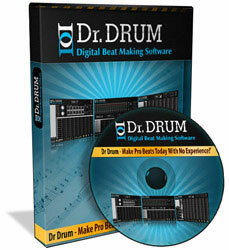 Click HERE to visit the Dr Drum Site and See it for Yourself NOW! When you see what this powerful software can do, you'll wonder why you didn't have it before!